Do you know what would make cleaning house way more fun? A maid. But if you can't have that, let our top pet-friendly cleaning tips help you out. Muddy paw prints, nose smudges, pet hair and more…living with a dog can be messy! But it doesn’t have to be. 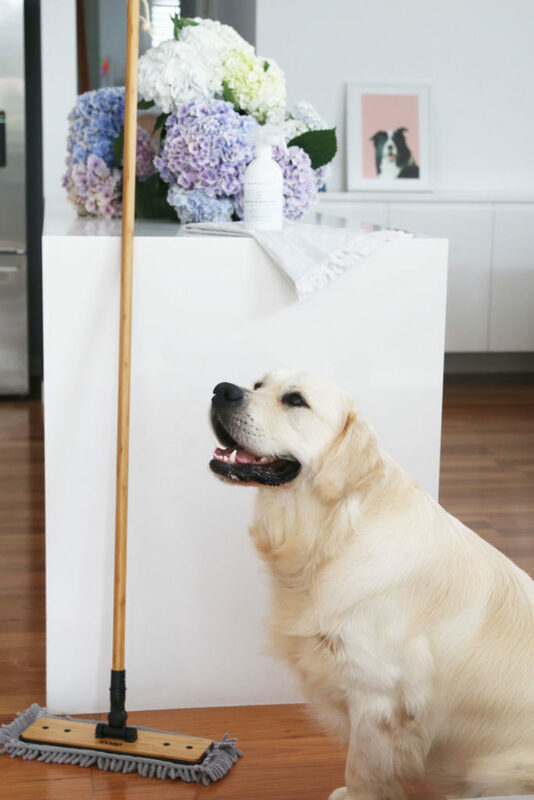 Our step-by-step guide to cleaning with pets will allow you and your pooch to enjoy a clean home everyday. Why split cleaning into daily, weekly, monthly, and seasonal chores? With a clear breakdown of what gets done when, you no longer feel like you’re chasing your tail (hello dog related pun!) with cleaning. Every cleaning and organisational expert recommends a small amount of cleaning every day combined with bigger jobs done on a regular timetable as the most efficient use of your time. This way every morning you get to enjoy a clean home to start with day with, as well as knowing the bigger jobs are covered as needed. 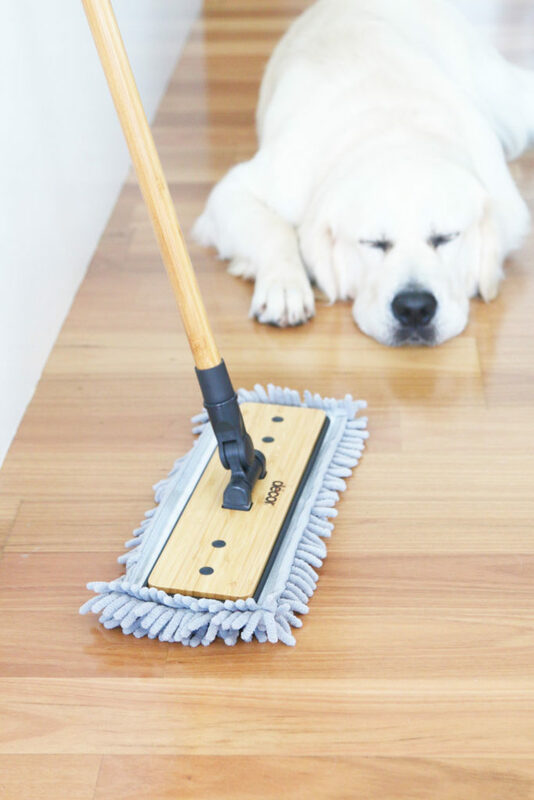 There’s no cleaning guilt or sweeping the floor 5 times over in one day. To put it simply: this routine works. 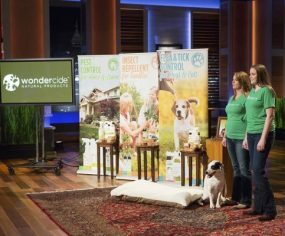 The timing estimates are based on having a 2+ bedroom home with one dog. Obviously if you have multiple pets, a 5 bedroom house, and children thrown in the mix, things may take a bit longer, but the principle is the same. These chores can all be done in a 15 minute time frame after dinner and leave your home sparkling for a fresh start the following morning. There’s no better way to start the day! Pick up all toys and personal items left lying around the house and pack away. Wipe down any kitchen surfaces or counters. I personally use this method of cleaning every week to get my house in tip-top shape. I follow this particular order of chores as it allows me to maximise the cleaning, with no downtime – getting the job done quicker! If you can I suggest popping your dog outside with their favourite treat ball while you clean. Alternatively have another member of the family take them for a walk. • Remove all sheets from bedding and pop in the wash.
• Dust tables and surfaces using a microfiber cloth. • Rotate your dogs toys in their toy box. 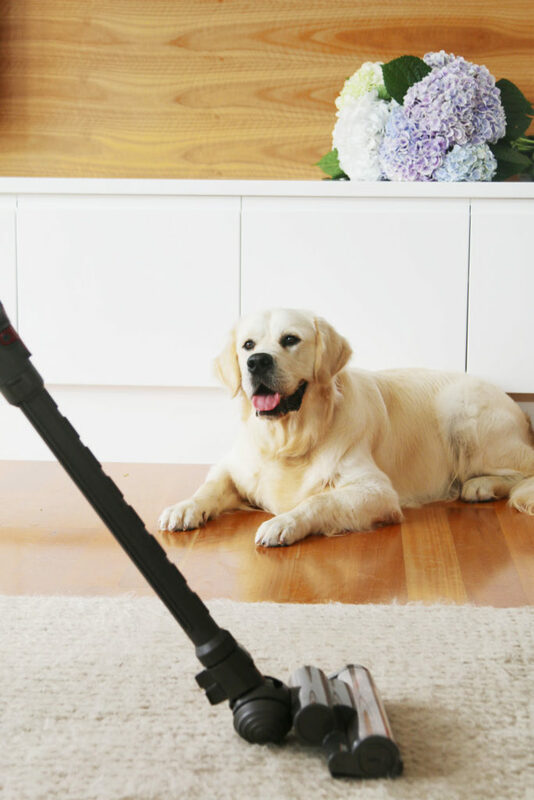 • Vacuum all rooms throughout the house, including soft furnishings and your dog’s bed. Use a lint roller to pick up any stray pet hairs on upholstery. • Clean your kitchen, wiping down surfaces, sinks and appliances. Replenish food supplies including dog treats and dog food. • Clean any glasses surfaces free of nose smudges and paw prints. • Mop all hard surfaces (such as floorboards, tiles) – it’s a good idea to leave this last so it has time to dry. • Clean your bathroom, wiping down surfaces and sinks. Clean toilet, shower and bath. Reward yourself with a shower at the end and you’re ready to start your day! 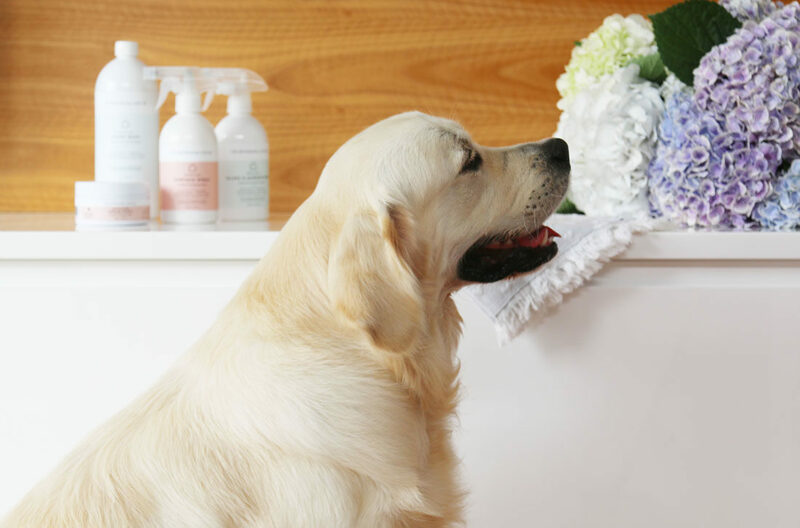 What Cleaning Products are Safe for Pets? 1. 100% non-toxic – making them safe for pets, kids and pregnant women. Cleaning products are used on all our surfaces where they can be soaked up into our bodies – keep them natural. 2. Made with natural but high concentrated ingredients that clean effectively. 3. 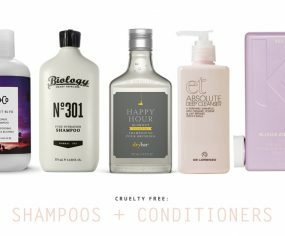 Vegan and cruelty free – not tested on animals and free of palm oil. It’s 2019. No animals need to be harmed to create a floor cleaner. 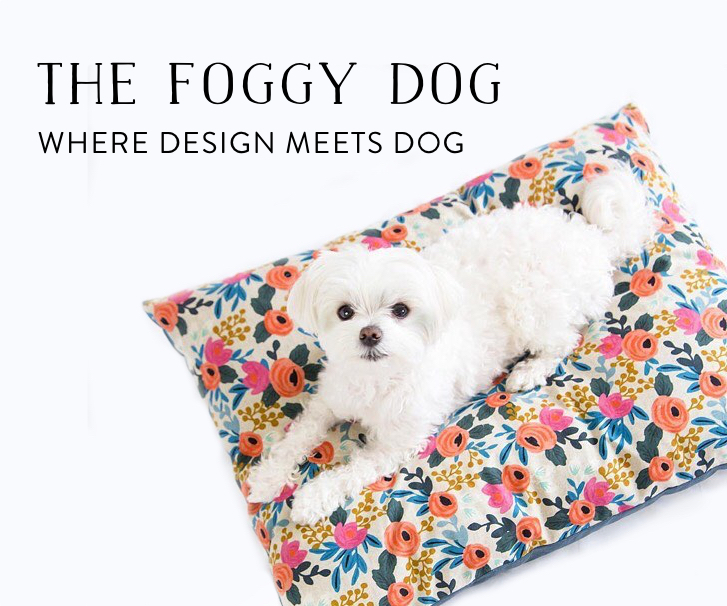 My favourite new range that ticks all of these boxes and more is The Botanical Life Co.
Their Home Essentials range are safe for pets & people, kind to the planet and they WORK. Their beautiful packaging had me at hello, but it was their gentle yet tough cleaning ability that kept me hooked. Not only are all their cleaners incredibly effective, they smell fantastic. My go-to’s are the High Shine Floor Wash (that smells like peppermint) and the Sparkling Surface Spray (that delivers hints of grapefruit). And just quietly – with a preschooler and a golden retriever, their Super Scrub Cream Paste has been a lifesaver on more than one occasion. Visit The Botanical Life Co. for more information and to shop. This easy cleaning and organisation session will set you up for the month ahead. • Wash all dog bedding, apparel, fabric harnesses, leads and toys. Most are machine washable these days but always check the label. For hard toys such as Kongs, hand wash and drip dry. 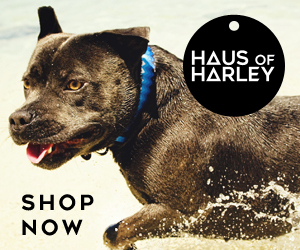 • Treat any leather collars and leads with a suitable conditioner. 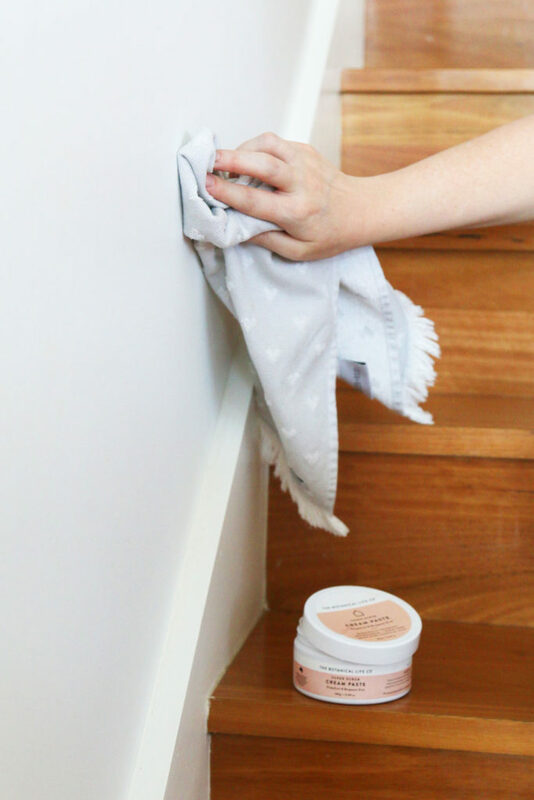 • Spot clean any marks on walls or furnishings. • Fully wash and rinse treat jars and all food containers. • Clean out any dog items from the interior of your car and wash any throws you use to protect the upholstery. • Stock take your pet supplies and order any waste bags, grooming tools, or medication your dog needs. 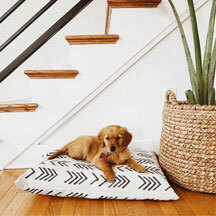 Depending on your dog and lifestyle you may not need to do all of these steps. Consider which ones you need, those you don’t and hop to it! • Spring Clean your dog’s things. • Clean out all food and medications and ensure they are within their use by dates. Discard any expired food or medication. • Steam clean carpets and furniture. • Wash all windows and glass doors inside and out. • Diarise your dog’s medical appointments, vaccinations and grooming bookings as needed. 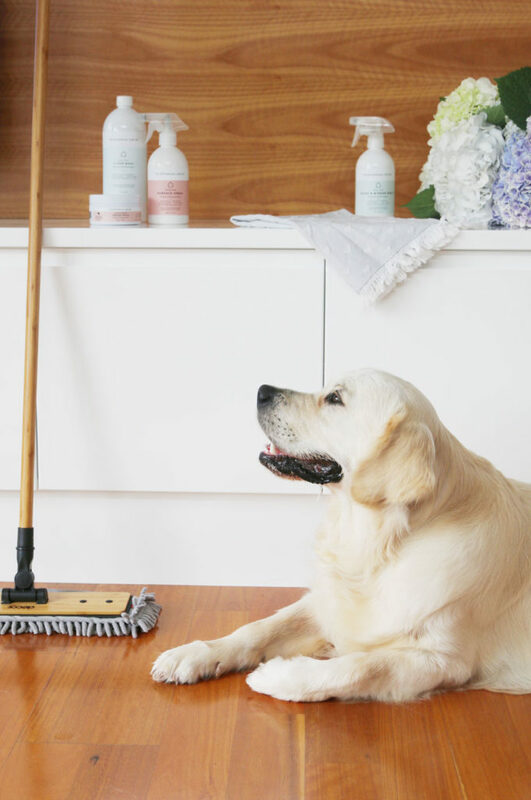 Our step-by-step guide to cleaning with pets will allow you and your pooch to enjoy a clean home everyday. This way every morning you get to enjoy a clean home to start with day with, as well as knowing the bigger jobs are covered as needed.